The initial prognosis that Australian jockey Daniel Moor’s fractured right hand would heal in a month’s time might have been a touch optimistic. After Moor had the cast removed last week, he was pleased to see he could get movement in his hand, but somehow, it was not 100%. His doctor then gave him the news he had been hoping not to hear. “I can move my hand but I can’t put any load on it. Obviously as a jockey, you can’t ride if that is the case,” he said. “My doctor told me it may take longer than he originally thought. Not exactly ideal, but that’s the way it is. “My season may be over, but I still haven’t completely ruled out a recovery in time to make it for the last meetings. The Singapore racing season has eight meetings left with the finale on December 9 when the Group 3 Colonial Chief Stakes (1600m) will be run. Moor hurt his right hand at a barrier trial on October 24 when he was getting the Mark Walker-trained Sacred Sham ready to head out to the gates. When the gelding suddenly reared in the holding area, the abrupt move twisted Moor’s hand in an awkward manner. The plucky jockey still rode the trial through the pain barrier, but X-rays later revealed he had fractured his fifth metacarpal bone. 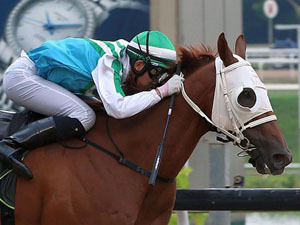 Moor, who was enjoying a rather successful first long-term stint at Kranji, was obviously disappointed the momentum had been interrupted, with a possibility he won’t get into the irons again until next year – if he gets relicensed. His last win came on October 21 aboard Lim’s Lightning (who contests the Group 3 Saas Fee Stakes over 1200m this Friday), the second pin of a riding double with King Of War, taking his score to 21 winners on 12th spot on the log. The jockeys’ licences for the 2019 season are currently being processed and will be released very soon. While it’s touch and go for a riding comeback this season, Moor can only watch the racing action on TV from home, but he will be at the races in his finest suit with wife Lauren on Gold Cup day on Sunday. If he had not been sidelined, he would have ridden Mr Clint in Singapore’s richest domestic feature race, the $1.35 million Group 1 Dester Singapore Gold Cup (2000m).